By day, Abdul Thaslim is your average student at Queensway Secondary. But when the sun sets, the spritely 16-year-old heads onto the track and field as part of SportCares' CareRunners running team and Saturday Night Lights (SNL) football team. A relative newcomer to running, Abdul Thaslim was starting defender for the SNL team, who managed a semi-final finish in the Delta League. One of the largest football competitions for youths in Singapore with over 2,000 players from 96 teams competing this year, the Delta League was formed as a way for youths to bond over sports, as well as raising their awareness of the consequences of being involved in crime. Thaslim showed incredible endurance during his soccer matches, running nonstop along the football field for full matches, which usually last for 90 minutes. His football coach spotted Thaslim's talents, and asked him to join the CareRunners programme. Thaslim's talent for sports seems to run in the family, with his younger siblings showing similar promise. Thaslim's sister (who has diabetes and a heart condition) recently won the females' 100m event at the National Para Athletics Championships this year, while his brother is doing well playing in the defensive and midfield positions in football. 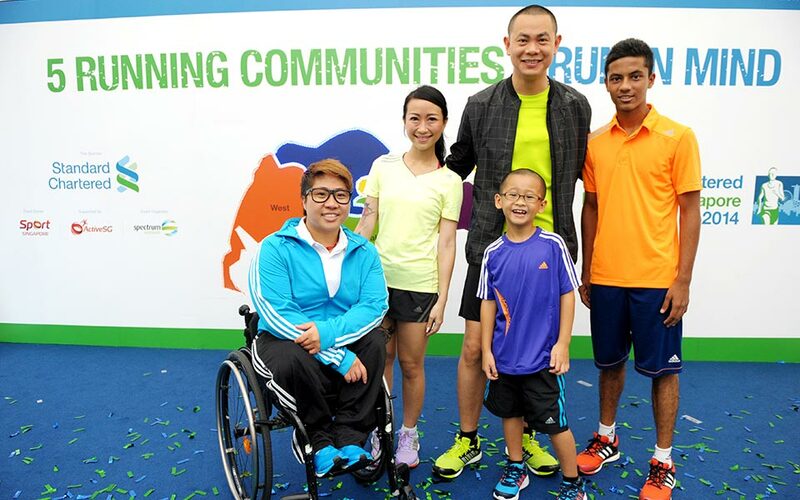 Thaslim is also 1 of 5 Official Ambassadors for this year's Standard Chartered Marathon Singapore, and has been actively helping out in the running community. 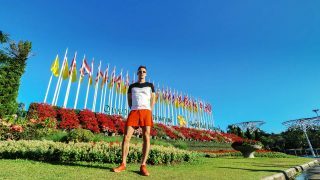 Having run the 6km Ekiden Charity category in 35 minutes at the Standard Chartered Marathon Singapore in 2013, he is looking to challenge himself further this year. 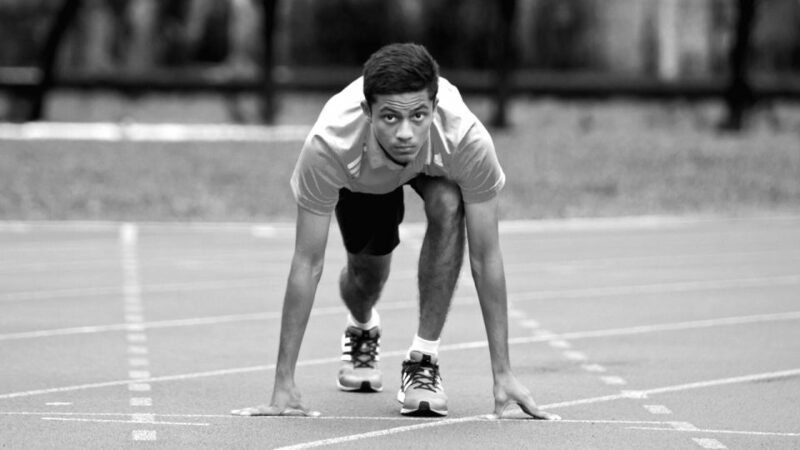 RunSociety talks to Thaslim on how football led to his newfound love of running! RS: You are originally from the Saturday Night Lights football team from SportCares Foundation. Can you tell us more about SportCares and the Saturday Night Lights? Thaslim: I joined Saturday Night Lights because my friends and my coach were talking about this new programme. At first I wasn't sure that I would be able to stick with it. The programme is much harder than just playing futsal with your friends. We have strength and conditioning training which really makes us focus on muscle development, agility, endurance and speed. I actually love these sessions now. 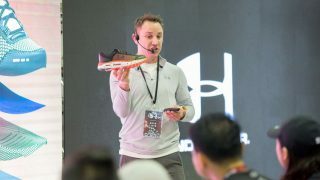 Also read: Meet Vincent Chen: He Puts the “I” in Under Armour Innovation! RS: And how did you join the CareRunners? Thaslim: I love football but I must confess that I am not the best footballer. My strength was that I never stopped moving. My then-football coach noticed that I could run the entire game and not get overtired. Man, it was tough. I wasn't sure I would come back. But other runners encouraged me and I got better. 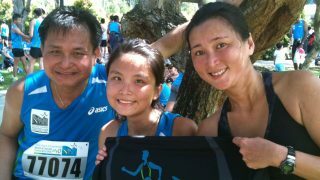 I was really happy to be chosen as part of CareRunners' first Ekiden relay team for the Standard Chartered Marathon 2013. RS: What's your aim as a runner? Thaslim: My first aim is always to improve my timing. Obviously, I want to run faster but I also want to run smarter. At CareRunners, I have learned to set and stick to a specific pace. My coach times every lap and tells me if I am going too slow or too fast. Our team manager calls me "Rocket Man" because I tend to wait until I think other runners have tapped out their reserves. Then I pour on the speed. I have a younger team mate who we call "Rocket Boy" because he uses the same strategy. So far, this strategy has been working well for us! RS: What distance will you be running for in the upcoming Standard Chartered Marathon Singapore 2014 (SCMS2014), and how is your training coming along? Thaslim: I am running the 10km for SCMS2014. I do distance running 2 times a week and strength and conditioning 3 times a week. I would like to do more but I need to manage my time between school and sport. Last year, I ran the Ekiden Relay which was a little over 6km, so this year's 10km distance will be more than 50% longer. It's a little intimidating but I am working carefully with my Coach Elangovan. RS: How do you manage to juggle your time in school with your other commitments? Thaslim: It's difficult. I love sport. But getting a good education is essential because it is the road to a good job and getting out of poverty. RS: As an Ambassador for the West Zone for the upcoming Standard Chartered Marathon, what activities are you involved in the lead up to December? 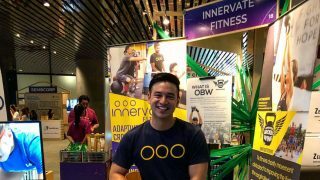 Thaslim: I have been attending the training clinics with Journey Fitness, and they always add to my knowledge bank of running. I have supported roadshows at the SportSG sports centres by encouraging people to run. And at the launch at Orchard Ion, I was handing out SportCares fans to all the people waiting in the queue. People had lined up even before registrations started. I am actually a shy person so at first I was self-conscious. But serving as an Ambassador has helped with that. RS: Your sister recently won the females' 100m event at the National Para Athletics Championships 2014 in May. Can you tell us more about her? Thaslim: I was shocked to see her get first place. She has diabetes and a heart condition so I didn't think that she could run that fast. She is also deaf so she didn't hear the gun to start. But she saw the girls start to run so she ran. And she ran really well! RS: You've played in the Delta League tournament as a starting defender for the Saturday Night Lights and made it to the semi-final stages. Any lessons that you carried from your soccer experience over to running? Thaslim: The rules of play are different, but the rules of behaviour are the same. Be disciplined. Be consistent. Respect your coach. Respect your teammates. Respect your opponents and your competition. Keep your promises. Don't expect to get anywhere without a lot of effort and commitment. RS: Are there any role models you have for running? Thaslim: Usain Bolt and Mo Farah, of course. But locally, Mok Ying Ren, the running doctor. It is amazing to me that he combines National Service, medicine and sport so successfully. Soh Rui Yong, who is another distance runner from Singapore studying at the University of Oregon, is really good at math, and I admire that. He broke a 41-year-old record in the 10,000 metres distance in June at 31 minutes and 15.95 seconds. That is so fast. He is a great writer, and I love to read his blog too. RS: You've got an equal passion for soccer too. What's your favourite soccer team? What about your favourite player? Thaslim: Manchester United, but this year, they aren't doing too well! My favourite player is Nani. We share a jersey number. When I wore my first jersey with the number 17, people said I played like him. And my strength and conditioning Coach Karan says I look like him! I love football because it is the first sport that I played at the void deck. It helped me make friends. RS: What's the activity that you enjoy most with your family? Thaslim: Sometimes we go to Jurong East Swimming Pool. I like cooking with my Mum (we make nasi biryani together. I cut vegetables and she does the spices and the cooking.) My little brother is also a good footballer, so I play with him. He is my friend, not just my brother. You already know that my sister is a runner. She is the happy noisy one. The house is so quiet when she is not there! RS: As a student and avid sportsperson, what motivates or inspires you to keep trying new challenges? Thaslim: I like to try new experiences. Whether the experience turns out to be good or bad, I will still learn from it. It all works out. I do not have a hot temper so I can learn something from almost anything! 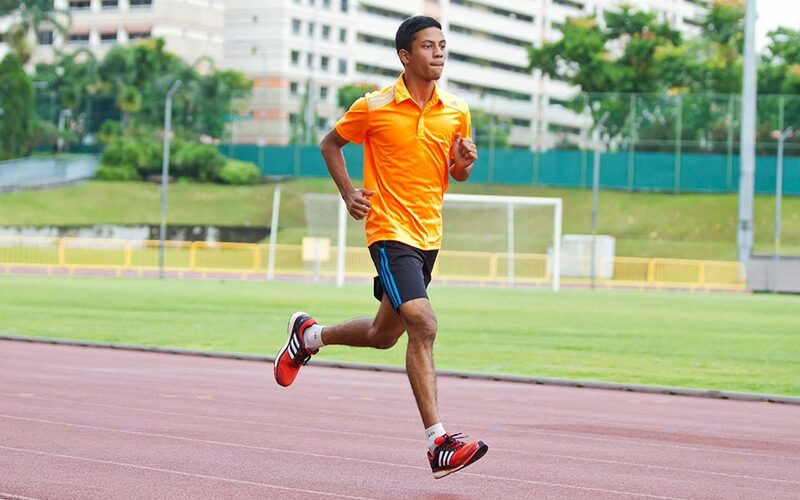 Thaslim will be tackling the 10km distance for this year's Standard Chartered Singapore Marathon 2014. All the best!